With the release of the Olympus OM-D E-M1X, the Micro Four Thirds manufacturer magically delivered medium format resolution. However, during a press event for the E-M1X, Olympus revealed that it actually contemplated developing a full-on medium format camera. According to Camera Jabber, Olympus executives Shigemi Sugimoto and Setsuya Kataoka (head of Imaging Business and division manager, Imaging Product Development respectively) revealed that the company had given consideration to developing a medium format system, but that it ultimately chose to remain committed to Micro Four Thirds. This has long been Olympus' party line, most recently stated at Photokina by European CEO Stefan Kauffman, but such statements have usually been in response to questions about the company going full-frame. Sugimoto and Kataoka's comments picked up some traction when images of an Olympus prototype – the modular M-System, pictured, which features a medium format-style body – were unearthed, but this was actually an old 35mm camera, not a recent medium format design. 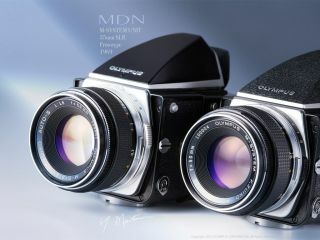 Previously, of course, Olympus did make medium format cameras, starting in 1936 with the Semi-Olympus I.